We are devoted to bringing a versatile and advanced product line to every customer. Here at Stanley Company, we make sure that we maintain and integrate the subtle engineering advancements made every year. We are licensed, bonded and guarantee that we provide top-standard workmanship. Years experience in decorative concrete industry. Present on each job, our father & son management team. Percent effective communication strategies with clients. As a family owned business, Stanley Company is founded by the father and son team originally as a large commercial concrete company. During that time, we occasionally accepted orders and jobs for family and friends on the side. Because of the quality results, demand increased and we opened a division for residential projects. Over the following decade, Stanley Company decided to focus on residential clients, bringing versatile and advanced products. We maintain and integrate the subtle engineering advancements made every year. Today, both father and son are not the only ones conducting the estimates but both are still present on each job. Our team produces the highest level of quality in projects, while employing efficient communication strategies with customers from beginning to end. Who will be present at the job site? Both father and son are not the only ones conducting the estimates, but are still present on each job. What is the general cost of my project? We receive phone calls on a regular basis asking for a simple square footage number that we charge for regular and stamped concrete. Each job is unique and since there are enough variables that come into play (size, access to project, elevation changes, drive time, etc. ), we don’t give out a generic number. A phone call or email is a start in which we can get close, but a FREE ESTIMATE is the only way to get the accurate cost. We always try and work with the customer’s budget to optimize the project vision. 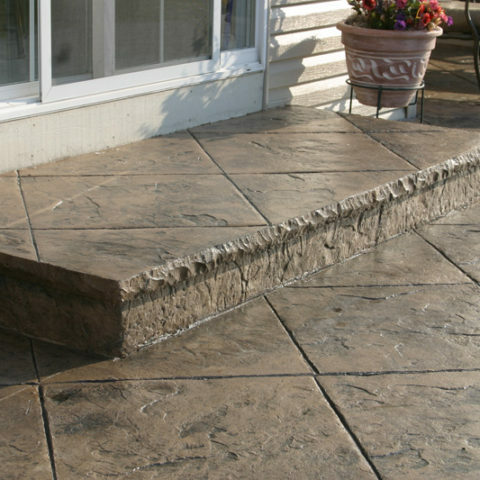 The process of stamping concrete is similar to any type of concrete pour. The place for the patio, walk or sidewalk is cleared and excavated to make room for gravel and concrete. The area is framed to the shape and style that was designed. A gravel base is added, 2-4 inches depending on local codes or engineering. Steel reinforcement is placed and then the concrete is ready to be poured. The customer has previously selected colors and stamp style. When the concrete arrives the proper color is added and mixed into the concrete. The concrete is then placed and smoothed to a trowel finish (similar to a garage floor). Once the concrete has set some it is checked for readiness to stamp. Once the proper set is confirmed the second color, release, is spread over the concrete. The stamps are then placed on the concrete and manually pounded into the concrete leaving the desired impression. Once the area is completed, the concrete is left to harden overnight. The following day the concrete is saw cut for control joints. When it is determined that the concrete has set enough it is pressured washed to remove the extra release and sealed when fully dry. The following day the area is ready for walking traffic. A full 7 days is necessary for cars. A typical job is three to four days.